This past February I joined the Triangle MQG and decided to participate in my first challenge with the group. We were given seven fat eighths of fabric from the Madrona Road line by Violet Craft for Michael Miller fabrics. Our challenge was to make something, anything really, from these 7 fat eights. And the only real rule was that you could only add other solids. No other prints were allowed. To make this even more challenging, I didn’t particularly care for this fabric. I liked the black with the writing, and the blue with the lighter blue criss-cross lines (I think it’s called haystack). But overall, the rest of the fabric is definitely not something I would have picked out. But it was free and I just couldn’t pass up free fabric or the challenge — I really do like to be challenged. The unveiling was planned for the May meeting — just 3 months away. Oh, what should I make? When I first got the fabric I was working a lot and didn’t have much time to think about it, but it was still in the back of my mind. A month later, I still didn’t have a clue. 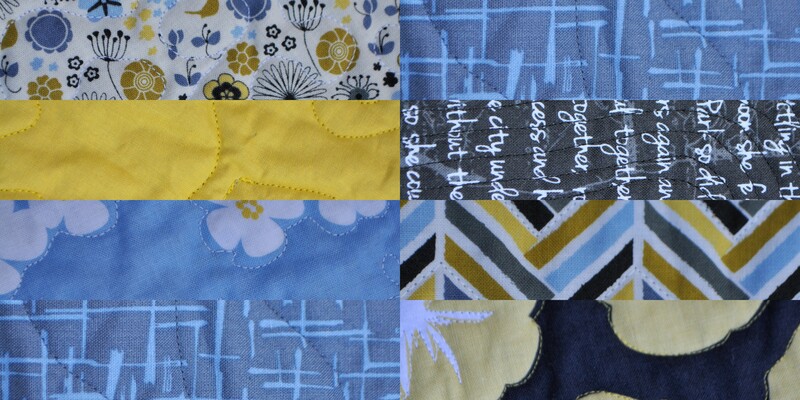 I thought I might want to turn it into a full size lap quilt, but seven fat eighths didn’t leave me much to work with. But work was slowing down just a bit, so I had a little time to play around. 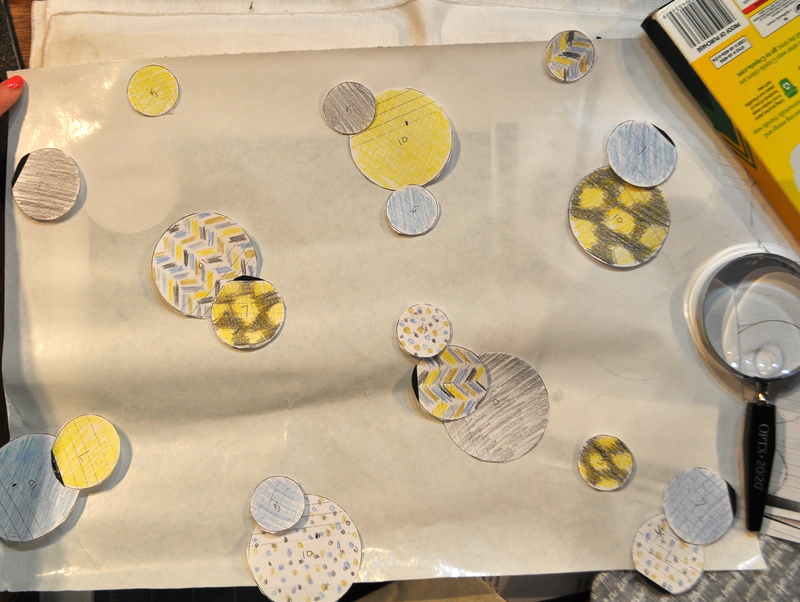 I played with circles… I even colored the circles to match the fabric hoping that would help. Did I want to make a stuffed toy? Did I want to make a skirt, or a bag, or a _____ (file in the blank)? This blue haystack I decided wanted to be an elephant. Cool, I could do an elephant on a baby quilt. I like baby quilts. I can be just as creative as I want to be, they don’t take too much time to make or quilt, and they make great baby gifts. But how do I fit the other fabrics into this? 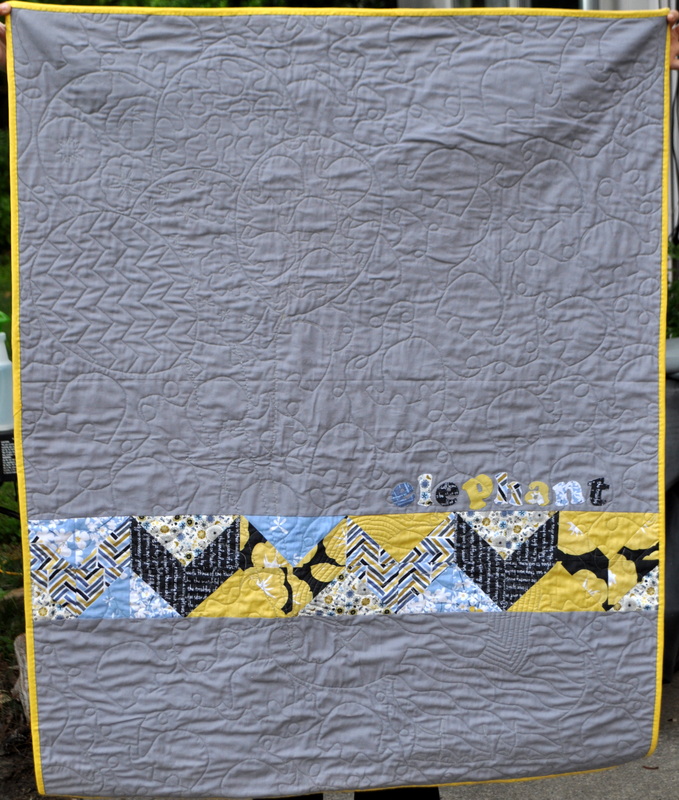 I could make an elephant parade, or elephants stacked on top of each other, or I could simply make just one elephant and use the other fabrics as a border. Or… the one elephant could be holding something in his trunk. Yes, that’s it! 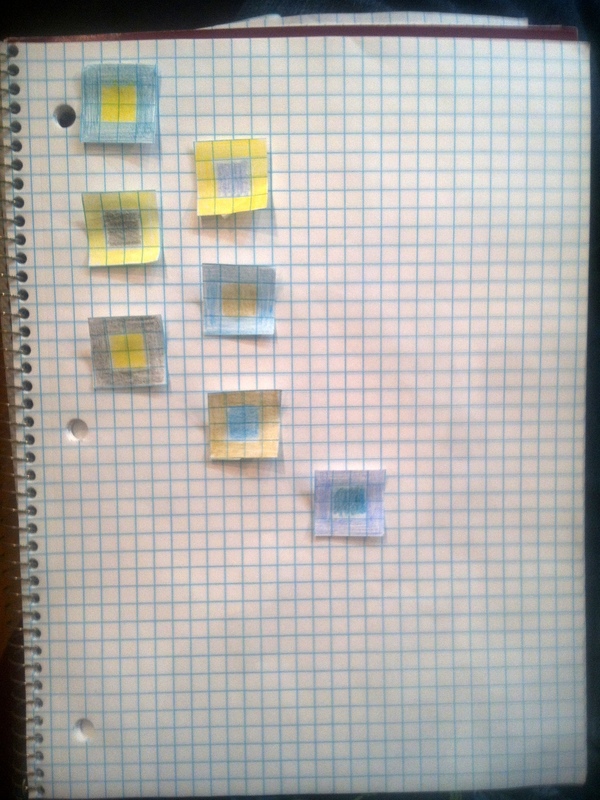 And the idea for my challenge quilt was born. It was designed, appliqued, quilted, and bound in about a week, and weeks before the unveiling at the meeting yesterday. 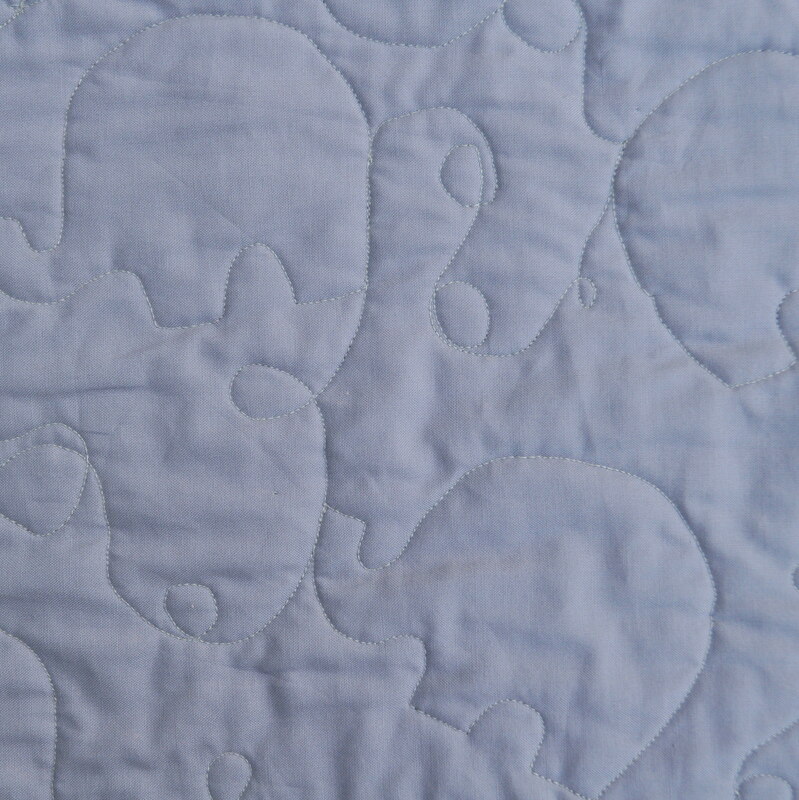 I also free motion quilted smaller elephants onto the background. I’m very pleased with how he turned out. If I had planned to make an elephant from the very beginning, I don’t think it would have been as good. I think my brain needed to go through the process of figuring out the personality of the fabric. And that’s how ideas are born… many weeks and months of planning, thinking, designing, and thinking some more. Then the idea is finally formed and the plan implemented, usually in a much quicker manner than what it took to come up with the idea to start with. 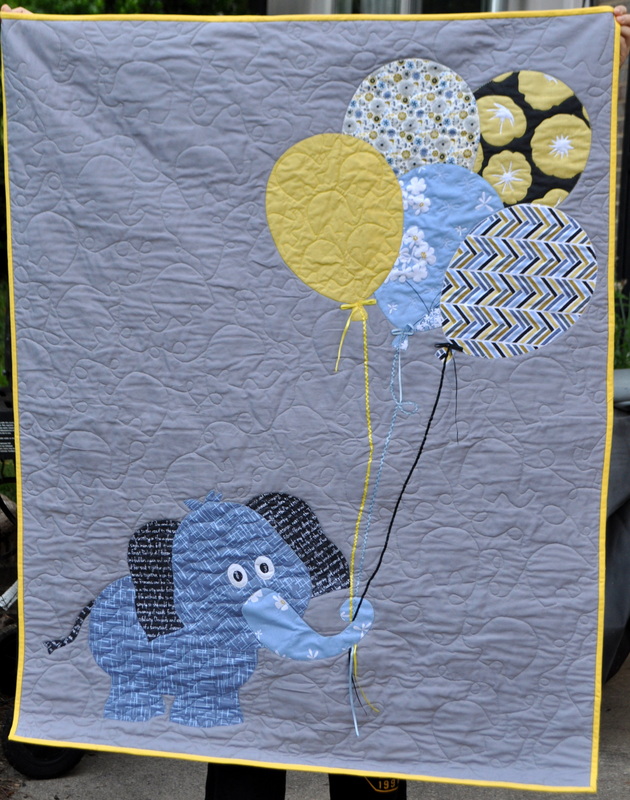 This entry was posted in Quilting/Sewing and tagged baby, blue, boy, challenge, crib, elephant, Elijah, fmq, haystack, how ideas are born, Madrona, Madrona Road, Michael Miller, modern quilt guild, MQG, quilt, quilting by monkeyneedle. Bookmark the permalink. I can’t believe you free motion quilted ELEPHANTS! I have trouble with squiggly lines much less any type of shape. Beautiful quilt! wow! this is simply adorable. everything is perfect together – down to the quilting! i’m so impressed! Wow, what great quilting and so cute! Well that was defintely worth the wait! What a stunning quilt!! And so cute too! My brain kind of works like that…put things on simmer and wait for them to inspire me in just the right way. The quilt turned out really cute! I’m in love with little Elijah. I really love elephants and this is the second elephant themed quilt I’ve seen in as many hours. You’ve also helped me think of an amazing circus elephant baby quilt I’d like to make. I’ll have to addd it to the list. Again, it’s so very pretty…Great job! Thanks for the kind comments. I would love to see your elephant when done. A circus elephant does sound amazing! Thanks so much! I enjoyed seeing everyone’s projects. We have some very talented members.